Rita went home to be with Jesus after a brief battle with cancer on Saturday, March 23, 2019. She was greeted by her husband Art who had passed away this past February. She is survived by 4 sons: Harold (Judy), Ron, Marv (Lisa), Dave (Nicole); 7 grandchildren: Jordan, Chad, Austen, Dakoda, Taylor, Skylar and Cole; her brother Helmut (Inge) Freiter; and one sister-in-law, Martha (Art) Rode. A Memorial Service will be held on Saturday, April 6, 2019 at 10:00 am at Springfield Funeral Home, 2020 Springfield Rd, Kelowna, BC. In lieu of flowers, memorial donations may be made to Green Bay Bible Camp, www.greenbay.bc.ca/donations/. 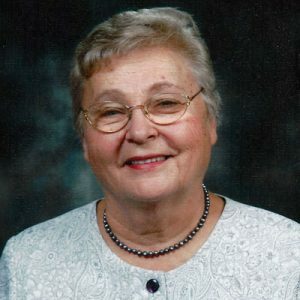 The service for HUBER, Rita is scheduled for Saturday, April 6, 2019 at 10:00 am . Below you will find the map for the service location and the contact information should you have any questions. It’s is with great sadness that I send my deepest condolences to Harold, Ron, Marv and Dave and their families. Your mother was a beautiful lady and deeply touched my life in many ways. She was an amazing Oma to Austen and has impacted his life and touched his heart deeply. May God hold you all in His arms and comfort you knowing both your parents are reunited in heaven and their faith, love for others and strong family roots leaves a huge legacy for all of you. Much love, Kim. Tante Rita, you will be sadly missed. Fondly remember all the times our families had together as I was growing up. We know that you are with Onkel Art and the Lord. Heartfelt condolences to my cousins Harold, Ron, Marv and Dave and their families. “And I heard a voice from heaven saying unto me, Write, Blessed are the dead which die in the Lord from henceforth: Yea,,saith the Spirit, that they may rest from their labours; and their works do follow them.” (Rev. 14:13). Our deepest condolences to the families of Rita now, and Art. May the above Scripture verse be a blessing to you in you loss. Ingrid cherishes fond memories of her cousin Rita, as they spent a lot of time together in Germany, like sister and sister. Rita will be sadly missed. My very deepest condolences to all of you on Rita and Art’s passing. What a blessing for them to go close together but so very tough for those they leave behind. My heart goes out to all of you. Rita and Art were super special people and I know Mom and Dad cherished their friendship so very deeply. They will be greatly missed. She was such a great hostess and cook and made the best buttermilk soup ever. May God bless you and comfort you all and give you the strength you need one day at a time. We herewith extend our sincere sympathy on the passing of your mother, grandmother, sister, friend of many and are sorry for your loss. We enjoyed our friendship in the later years of our lives, had two vacations together, and marveled at her kind and loving hospitality, great tasting meals, open discussion about a lot of things, phone calls about medical issues, etc., Some times we reminisced about our relationships, as my mother and Rita’s father were first cousins, and suffered very similar situations during the war years when we were quite young. Art and Rita did not visit often, but on occasional trips to Edmonton we always had a good time together. We will miss both Rita and Art very much in our lives. They were prayer warriors and now see what they have believed and lived all of their lives with Jesus. May the Lord comfort you and bless you all abundantly as you go forward without your parents/grandparents at your side. Lieber Harold, Ron , Marc und Dave mit Fam. Unser tiefes und,aufrichtiges Beileid zu diesem schweren Verlust und wünsche euch das ihr durch diese sehr traurigen Zeit von Gott getragen und getröstet werdet. Wir werden sie sehr vermissen und sie werden immer ein Platz in unserem Herzen haben.